For the past couple of years Target has been selling cheapo bagged mini figures in its dollar section. The figures are made by Toysmith, and so far they've released bags including dinosaurs, knights, pirates, mystical ponies, fairies, and maybe one or two other themes. Now there's some brand new sets out in Target that are the best yet -- Super Heroes! 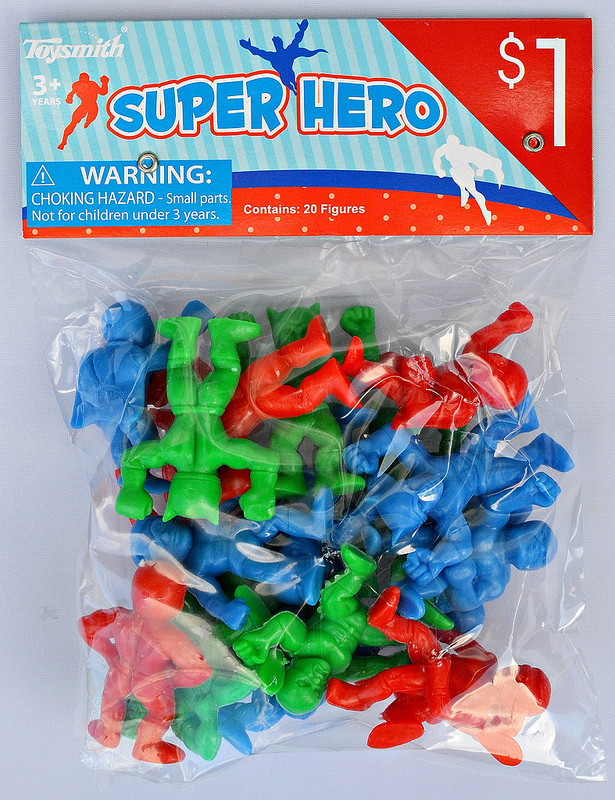 The figures come in a clear bag with very basic header art that refers to the figures simply as "Super Hero." Nothing fancy, but what can you expect for a buck? 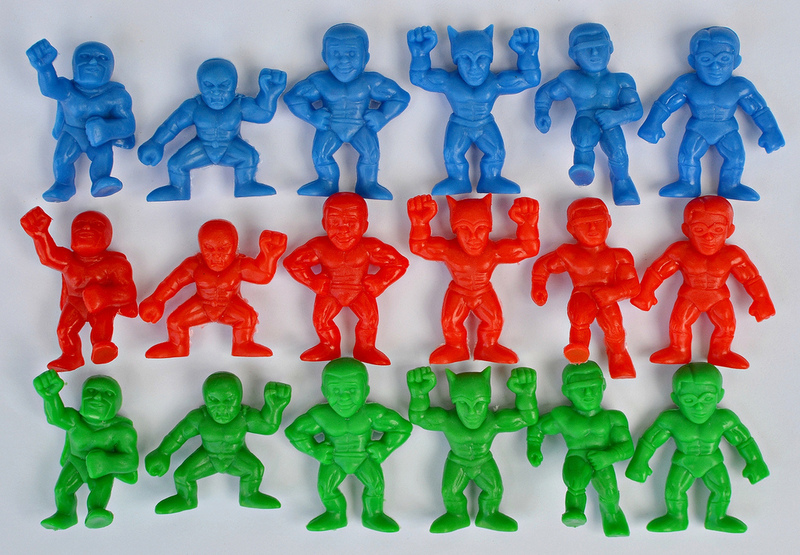 There are six different sculpts that come in three different colors -- red, blue and green. Each bag contains 20 figures so I suppose it's possible to get a full set of 18 in a single bag. They seem to be put into the bags pretty randomly though, so it's probably not likely. I did come very close in the first bag I opened, which was missing only one sculpt in green. I was able to find that figure in the second bag, but I did notice that it contained more duplicates than the first bag. For anyone planning on buying some, it's probably worth taking a close look at them in the store to make sure you pick bags with the most different figures. The figures are made of a light, hard plastic. It's a bit cheap feeling, but again, these are designed and sold as cheap toys so it's to be expected. The sculpts are pretty cool. My favorites are the caped, masked guy with his fist forward and the pointy-eared guy with both arms up, which I think has some Batman inspiration. 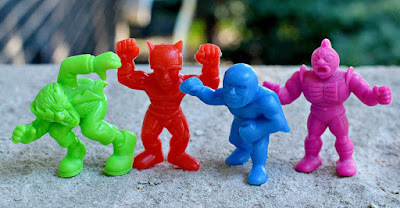 For some reason these guys actually remind me more of wrestling toys than superhero toys. Maybe that's because they're done in a bulky, stylized way that gives off a similar vibe to '80s wrestling minis like Musclemania, Remco Mini Mashers, Soma wrestlers, and of course, MUSCLE. Size-wise, they're comparable to the usual suspects like Monster in My Pocket and MUSCLE. So what do you think of these little weirdos? Do you plan on picking any up? I hope Toysmith continues to make these cheap minis for Target -- I'd love to see a fantasy or monster themed set released next! I need to get to Target ASAP! These are pretty darn cool looking, especially for a buck! Definitely a buck well spent! Were you able to get any? Am heading to mine tonight after work! I saw on IG you found some! What! You didn't buy the fairy pack as well? Haha, I did not. But I did end up buying a pack of the Mystical Ponies when those were out, so I wouldn't put it past myself. Thanks for the heads up on these! As soon as I seen this post I ran to my local target and got 2 bags..I messed up and didn't look to close enough and ended up still missing 2 green. Maybe green's are more of the random one's? Either way I didn't see many left, so to all trying to get them, you better hurry!